“K” Boutique Hotel is a fully renovated hotel in 28 Ialisos Av. of Ixia. The hotel is 5 km from the center of Rhodes, 10 km from the airport, 150m from the beach and 500 m from the village of Trianton. In the sourrounding area you will find many restaurants, taverns and clubs. “K” Boutique Hotel is a modern and luxurious hotel with 30 two-space Suites. There are 21 Standard Double rooms. They have an extra sofa bed, which can accommodate one more person. There are 2 Deluxe Double rooms, more spacious than the Standard and with open view to the hotel garden. They can accommodate up to 3 persons. There are 3 Junior Suites with private Jacuzzi, which can accommodate 2 - 4 persons. 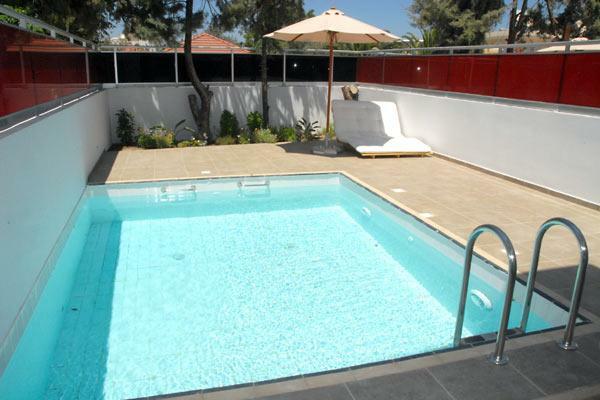 There are 4 Junior pool Suites with a private pool, which can accommodate 2 – 4 persons. All Suites are fully equipped with satellite TV, Internet access, mini bar, safe box, central heating, A/C. The hotel has a pool, pool bar, open kitchen, restaurant, gym – spa – massage, room service until midnight, business center and conference room with a capacity of 100 pax., lobby. Transfers from/to the airport upon request. Είστε ιδιοκτήτης ή διευθυντής στο K BOUTIQUE HOTEL; Εγγραφείτε τώρα για δωρεάν εργαλεία, που μπορείτε να χρησιμοποιήσετε για να βελτιώσετε την καταχώρησή σας και να συνδέσετε την ιστοσελίδα σας και το σύστημα κρατήσεών σας.